This gold bird's nest charm is so adorable. It has 4 little eggs nested right in the middle. This is so cute for bird themed ATCs, great for greeting cards as well as a great charm for jewelry. 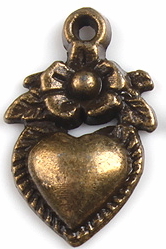 This charm measures 1/2 in. wide x 5/8 in. from the top of the loop to the bottom of the charm. You will receive one charm for each quantity that you purchase.